I'm sorry to inform you that Geoff Gilbert died in the early hours of last Saturday, 4th December. Geoff joined the Handlebar Club in the early 1990's and took an active part in many of our events for a number of years, being one of successful dart players! He had been suffering from ill health over the last few years with particular problems with his legs. Rumour was that this problem arose from his time in the Parachute Regiment but it was not (unusually for Geoff) something that he spoke about. His funeral is at 1.00pm next Thursday 16th December at St Paul's Church, Long Lane, Finchley N3 2PU. It's a 10 minute walk from Finchley Central tube station which is on the High Barnet branch of the Northern Line. 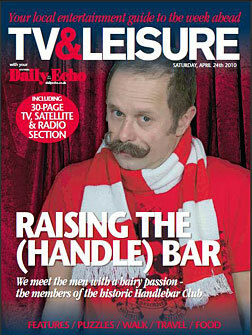 If you can spare the time please make an effort to see off a fellow Handlebar. 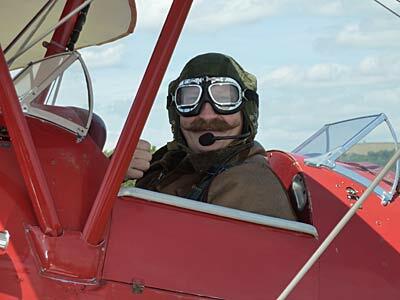 Club member Roger Garbett celebrates his 50th birthday, and his present is to go Up-Tiddly-Up-Up on a flight in a Tiger Moth, and as you can see he's putting his Handlebar to proper use!" Once again it's that time when the whole world goes moustache crazy and everyone is growing a 'Mo' to support Movember and The Prostate Cancer Charity. It's Friday night in Shoreditch, London and a small band of moustache oficionados have gathered at Murdocks Barbershop to 'shave into' Movember. Aspiring 'Mo Bros' are there to have any offending fuzz removed in anticipation of November 1st. One very brave, or possibly foolhardy young lady named Taryn, has come with the intention of having her eyebrows removed, and our Potty President is eagerly expected and has promised something special - nothing less than a whole new alter-ego. 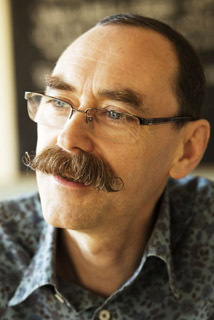 Suddenly a strange noise began to emanate from the gentleman's convenience... Read Steve Parsons' deeply Mo-ving REPORT on what happened next! Click on the small triangular play button in the player above to start. 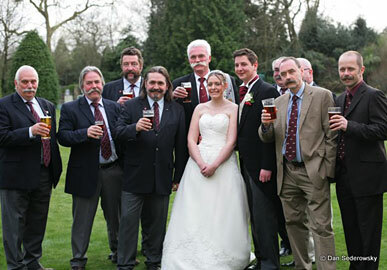 The Handlebar Club Wedding of the Year! The beautiful bride Keri and groom Steve, with a lot of Moustaches. 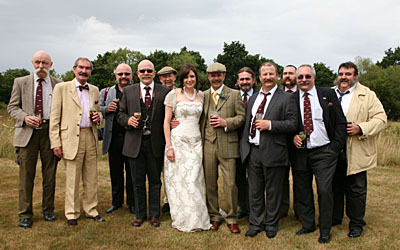 The Wedding of Keri and Steve Parsons this Summer was attended by Moustaches of Honour from The Handlebar Club. From left to right: Jock, Jonathan, Dan, Rocky, Tony, KERI, STEVE, Ronnie, Andy, Lewis, Rod and Jörg. 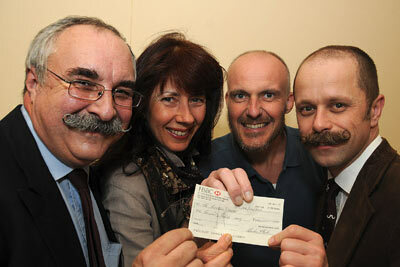 Club President Rod Littlewood and Secretary Steve Parsons along with Friend Andy Nelson present a cheque for £1000 to Gail Maguire, manager of the Fountain Centre in Guildford. The Fountain Centre is an independent charity based in the St Luke's Cancer Centre at Royal Surrey County Hospital, Guildford that supports people living with cancer. It's a place where they get to meet others in the same position, with the same hopes and fears, to share their stories and experiences, to support one another and try new therapies and activities together. It's a place that means a lot to Andy, and the Handlebar Club are delighted to be able to support such a wonderful place. In the first week of June, Handlebar Club member John 'Redz' Redmond and some of his friends from Bexley will relocate to the north of England to raise money for World Cancer Research and the Ellenor Lions Hospice. 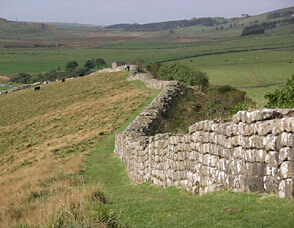 They will be attempting to walk the 84 miles of Hadrian's Wall in 4 days (yes, that is just under a marathon a day, four days in a row!) and by their own admission they are "some of the most unfit, unhealthy smokers in the northern hemisphere." Redz says, "Every mile we train brings home how tough this is. Make no bones about it - this will be seriously challenging. And we need your support!" 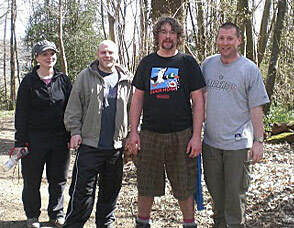 Please check out their website uk.virginmoneygiving.com/hwchallenge to support these charities. "When the historic Handlebar Club held their annual convention in the New Forest, SARAH JONES of The Southern Daily Echo couldn�t resist going to meet them." Now you can read her article and photo feature about the Club online. Continuing the tradition of appointing the club's Prime Handlebar at each year's AGM I am very happy to announce that the Prime Handlebar for 2010 is Mr Geoff White. 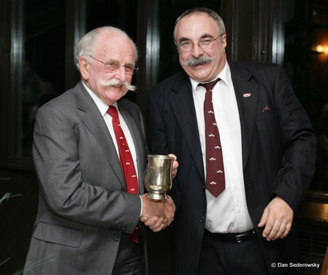 Geoff received the club trophy along with a birthday cake to celebrate his 90th year at the 'gala' dinner at this year's gathering in the New Forest. Congratulations Geoff and keep your hands off those oranges! Members gathered at The Lyndhurst Park Hotel in Hampshire, a grey assemblage of blocky annexes looking more like the Lyndhurst Hospital, for the 2010 AGM weekend. As usual the AGM was quickly accomplished after a late start because everyone was stuck in the local tourist traffic, and the more serious business of drinking and eating began. Read our re-elected and spirited Secretary's report on the weekend, which describes our luxury chinese dining, dedicated drinking, a sea-faring voyage of discovery, and how the company of Members narrowly escaped becoming the Moustached Harem of the lovely bride Gemma. 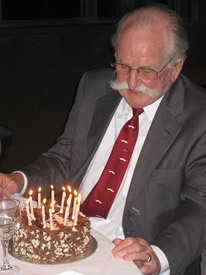 Members recently gathered at The Griffin Inn in Fletching, East Sussex, for a weekend of celebration to honour the posthumous 90th birthday of 'Professor' Jimmy Edwards, one The Handlebar Club's esteemed Founders. 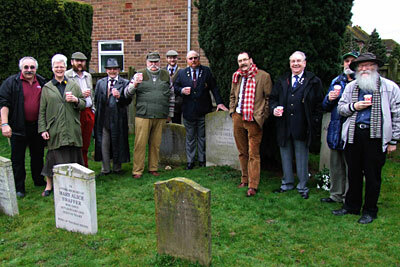 Jimmy Edwards lived at Atherall's Farm in the Sussex village of Fletching, so where more appropriate to crack a cork and toast his memory than at Fletching's Church of St Andrew & St Mary the Virgin, in the churchyard at his headstone. Read our prestigious President's report on the weekend, and marvel at the fireside tale of The Empty Chair, rain-swept visits to Sheffield Park and The Bluebell line, and culminating with a sumptuous gastro-dinner in the company of Jimmy's relatives.